BINGO-FUSHIORI is a new brand derived from BINGO-KASURI. It's unfamiliar even to some Japanese people. Bingo Fishi-ori is a new fabric brand which is derived from Japanese traditional textile. Bingo-Kasuri is one of the three best traditional Japanese cloth with a splashed pattern like Kurume-Kasuri and Iyo-Kasuri. 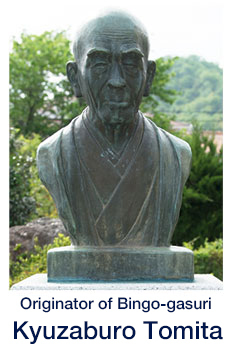 The origin of Bingo-Kasuri began over 100 years ago in a small town called Shinichi in Fukuyama city in Hiroshima Prefecture. In the past, there were many factories which mass-produced this cloth. Recently though, there are only two existing companies which stick to traditional dyeing and weaving methods. By its nature, the feeling of Bingo-Kasuri is smoother, compared with other Kasuri fabrics produced by companies in other areas of Japan. The special feature of Bingo-Kasuri is the neps in the cloth. A nep is an intentional irregularity put in the cloth during the weaving process, which gives a cloth a warm simple touch like hand woven cotton though it was woven by a machine. That special cotton touch is brought about by an old-fashioned 1950's style shuttle weaving machine. The characteristic of this machine is to weave a cloth slowly. While the shuttle which has wefts already put inside moves leftwards and rightwards, while the shuttle weaves yarn between the two warps. It can weave a cloth without spoiling the soft touch of cotton which contains air inside during the weaving process because the shuttle doesn't cause much tension on the wefts. Because of the air contained in the cloth, you can feel cool in summer and warm in winter wearing Bingo-Kasuri cotton clothing. It's also easy to handle because it's washable material for daily use. The cloth becomes more comfortable and softer with age. The textile manufactures are particular about choosing yarns and dyeing methods. Plain color cloth will be produced varied from natural color to chic tone. The dyeing process is mostly organic. The colors are organic colors which are made from natural indigo, persimmon juice and charcoal. The weaving machine's characteristics make it possible to express natural discoloring. There are some dotted nostalgic patterns and a variety of patterns such as stripes, checked, etc. At the factory, artisans are endeavoring every day to dye yarn with their own hands and dry yarn in the sun paying the closest attention to the weather. Bingo Fushi-ori is a plain and heartwarming textile that has been handed down from generation to generation continuing the fine repetitive craftsmanship in the finished fabric. Bingo-Kasuri was the most famous Kasuri in production for over two decades and it held 70 percent of the Kasuri market in early 19th century. We tried to trace back its history by walking through its hometown. Since they began mass-production at the beginning of Meiji-era( more than 140 years ago), it gradually became well known throughout Japan. From late 1920's until the early 1930's, the process was mechanized and the amount of textiles increased to about 20,000,000 yards per year in 1932. During the World WarⅡ, they stopped the production. After the war, they began to produce it again with an amazing revival. In the days after the war, they used the weaving machine and in return it brought about huge profits and as a result, Bingo-Kasuri became very famous throughout the country. But from the end of 60's, since Western fashion became popular in Japan and traditional Japanese clothing, kimono, began to disappear. Also because of the rise of chemical fiber appeared. At present, only two companies, Morita Orimono and Kittaka Brothers & Co. are manufacturing "Bingo-Kasuri", they continue to use traditional techniques keeping Bingo-Kasuri in fashion. 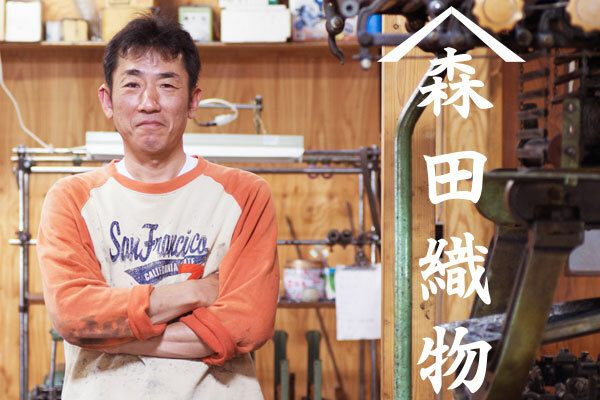 They produce not only kimonos and working uniforms but also western-style clothing, accessories, sundries and so on. Because they are always searching new ways of using the fabric, they increased the number of variations of materials, colors and patterns according to the customer’s needs and the changes of the times. Bingo-Kasuri is still used preciously among the people who cherish nice goods. This is how Bingo Fushi-ori has come to be known in this time and age. ◆References: "Bingo-Kasuri" A Selection of one hundred famous "Pieces of Hiroshima Cultures No.3 Folk-craft and Folk-articles version". The textile manufacturers are " Morita Textile" and " Kittaka Brothers & Co."
These two separate companies together are continuing the traditional manufacturing methods while also making necessary improvements. After the yarn has been made into a fabric, it is boiled and dyed. Since the fabric is dyed by natural indigo, persimmon juice, and charcoal and is dried in the sun in order to get natural color, the process is influenced by the weather. This gives each batch its own characteristics. It is impossible to make identical batches. This is one of Bingo-Fushi ori's specialities. Because natural sunlight is a major factor in the manufacturing process, it is common to have to wait for sunny days to dye the fabric. Thus, the production of Bingo-Fushi -ori is limited to a small amount. Therefore, they are very precious. We hope the people all over the world will be able to enjoy using Bingo-Fushi ori. Morita Orimono dyes yarn with completely natural dye since they stick to the work ethics that "The only way to survive is to continue to work with a lot of time and labor." 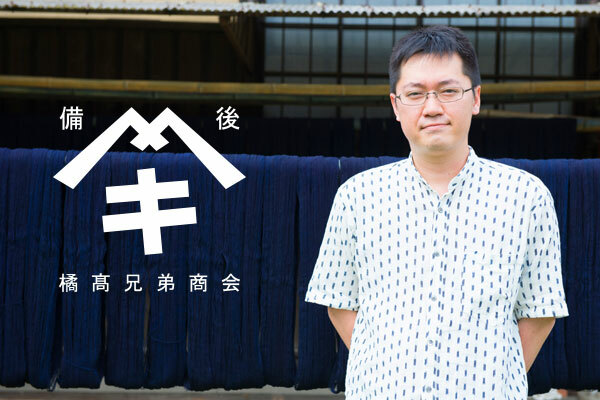 Today's successor, Kazuyuki Morita dyes fabric with traditional natural indigo and recently he began using charcoal and persimmon juice. He heats the dye to 90℃ and begins stirring in the fabric and continues to stir the fabric until it becomes the perfect color. He then starches the fabric and then he begins the drying process in the sun according to the weather. After the fabric has dried, he washes it again and again to get rid of impurities. The dyeing process is a very time consuming and industrious job in order to dye the fabric evenly, and to insure the fabric's color will remain its deep color for years to come. Kazuyuki also has many new stylish patterns. Recently, he has also begun to make fabric made of cotton and hemp. He says" I don't do anything special. I only continue to do the same work everyday." The fabric has natural and profound touch which is almost the same as washed-out jeans. You will surely realize the nice feeling as soon as you touch it. Another manufacturer was founded about 100 years ago. They used purified water sprung out from the ground along Ashida River to dye yarn and wash it. Since they use both natural dye from persimmon juice, madder plant juice, pomegranate juice, and chemical dye, they have a large variety of color variations. Kittaka Brothers & Corp. wants to produce materials and goods for higher practical use to meet the needs and demands of the customers for western-style clothing. Due to the popularity of western style clothing, they have changed their motto to "Quality and Variety". I grew up surrounded by Kasuri. My father set up his company when I was just a little boy. He was taught many valuable things about business by Mr. Kittaka of the Kittaka Bingo-Kasuri manufacturing company. At the beginning of my father's business, he sold fabrics to retail stores and designers, which were woven only by Mr. kittaka. Therefore, when I succeeded my father's job at the age of 26, we dealt in traditional art craft fabrics, old fabrics, and of course, Bingo-Kasuri. After I become confident as the owner of my company and began to think about the company's future, my father got ill and passed away. Since I took over my father's company I have felt a sense of crisis due to the declining popularity of Bingo-Kasuri. It was in the winter of 2013 when I decided to renew Bingo-Kasuri in hoping to bring back a traditioned and stylish Japanese fabric to help the manufacturing companies thrive again. We hope you will be pleased with the quality and workmanship of our new product.